Fame . . . . So writes Minnesotan Robert Bly in his poem "Thoughts in the Cabin." Before there was the men's movement, before fame dogged his steps and laid siege to his cabin, Robert Bly was a poet. "What is it I want?" he asked back then. "Not money, / not a large desk, a house with ten rooms. / This is what I want to do: To sit here, / Take no part, be called away by the wind." The poet's desire for "no more fame" has not been fulfilled, but Eating the Honey of Words, selected from the work of almost 50 years, reminds us that in spite of the large role Bly has lived in the world beyond his cabin, he's never stopped being a poet. Since the 1950's, Bly has been a vocal, sometimes violent critic of American poetry, especially the legacy of the "1917 Generation"Ezra Pound, T. S. Eliot, and William Carlos Williams. In an essay called "A Wrong Turning in American Poetry," he blasted their outward-looking, object-oriented aesthetic as poetry "defined without reference to the unconscious." Bly believed that a poet should follow Rainer Maria Rilke's directive to "go into yourself," and offered as exemplars of this path European and Latin American poets such as Federico Garcia Lorca, Pablo Neruda and Antonio Machado, whose works he later translated and published in his magazine The Fifties. In his own poetry, Bly developed what came to be known as the "deep image." His definition of this phenomenon distinguished the image from a picture: "The image, being the natural speech of the imagination, cannot be drawn from or inserted back into the real world." I could take handfuls of darkness! A darkness that was always there, which we never noticed. By the late '60s, the meditative, transcendental mood of Bly's work shifted as he became an antiwar activist. As co-founder of American Writers Against the Vietnam War, he traveled the country staging read-ins, participating in protests and as his critics would have it, cultivating a notoriety he claimed not to want. Artillery shells explode. Napalm canisters roll end over end. The six-hour infant puts his fists instinctively to his eyes to keep out the light. In "The Teeth Mother," Bly began to use the Jungian archetypessymbols of death, birth, gender and other immutables, which psychoanalyst Carl Jung argued were universal attributes of the unconscious mind. The inwardness and personal nature of his early poems would evolve over the next 30 years into a more universal expression of the collective unconscious, his exploration of archetypes leading eventually to an extensive analysis of the male psyche. "The Teeth Mother" symbolizes the disintegration of the American psyche that the poet believed must result from the war. What caused us each to live hidden? A wound, the wind, a word, a parent. Awkwardly, not whole and not healed. 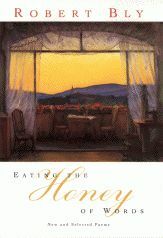 Eating the Honey of Words includes work from Bly's most significant past collections. From the gentle, surreal works of Silence in the Snowy Fields through the political poetry of The Light Around the Body, this anthological survey moves through the ecology-conscious prose works of The Point Reyes Poems, the sexual subjects of Loving a Woman in Two Worlds, on to the profound questioning of life and death in Meditations on the Insatiable Soul and some fewer, recent poems. Of things, had moved to Sweden. . . . The "taut giant" at "the center" has done an immensely beneficial job for American culture. Bly, like other giants of poetic activism, such as Allen Ginsberg, Gary Snyder or Anne Waldman, has not been content merely to live his times. He has actively challenged them, and his muse, far from abandoning him, has stood steadfastly, if battered, at his side.